Turkey issued presidential decrees on Sunday reshaping key political, military and bureaucratic institutions as part of the transformation to a powerful executive presidency triggered by last month’s election. 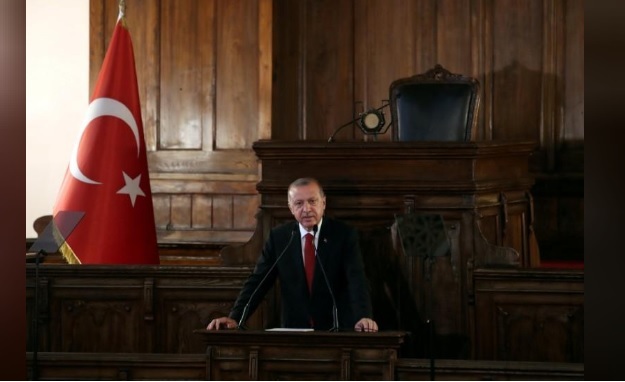 President Tayyip Erdogan was sworn in on Monday under the new system and now holds sweeping powers, allowing him to issue decrees on executive matters and appoint and remove senior civil servants. Erdogan has said the powerful executive presidency is vital to make government more efficient, drive economic growth and ensure security. Critics decry what they say is increasing authoritarianism and a push toward one-man rule. Among the latest changes, the General Staff was brought under the authority of the defense minister, according to state-run Anadolu news agency, a move following Erdogan’s appointment of military commander Hulusi Akar as defense minister. In total, the country’s Official Gazette published seven decrees affecting many state institutions, including the secretariat of the National Security Council, the Defence Industry Directorate and the State Supervisory Council. The changes coincide with the second anniversary of an attempted coup during which at least 250 people were killed, many of them unarmed civilians, when rogue soldiers attempted to topple Erdogan’s government. A state of emergency was imposed after the failed putsch on July 15, 2016 and is set to expire this week. Erdogan’s AK Party and its nationalist ally plan to introduce security regulations to ensure the “fight against terrorism” will continue after emergency rule ends, two sources told Reuters.